Canoeists could reach the lake directly, significantly cutting the expense and time to travel north of here. Keewaydin, using the road for the first time in 1967, began a remarkable pioneering era as it extended its trips north of the Rupert to the Eastmain River that year and then beyond to the Opinaca, Sakami and Old Factory Rivers. The next change for the James Bay region of the magnitude of this road arrival was the construction of the James Bay Highway (Route de la Baie James) by 1974. The photo above was taken in June, 1967 as the section unloaded at the end of the Mistassini road. The landing was on the east shore of Baie du Poste, seven miles south of the village of the same name, and just north of a large esker (forming a peninsula) that extended southwesterly into the bay. Heb Evans led the expedition and Dan Carpenter Jr. was a camper. 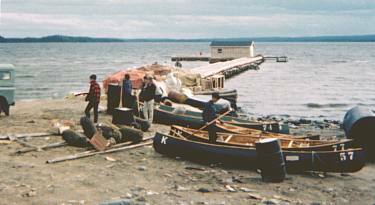 * Life for the Cree in the village of Baie du Poste (today Mistissini) on Lake Mistassini was radically altered. Between fall, 1969 and summer, 1970 the road was extended to the village. Sources: Adrian Tanner, Boyce Richardson, Dan Carpenter Jr., Jeff Gilbert, Keewaydin Archives, The Keewaydin Way by Brian Back, The Rupert That Was by Heb Evans. Up to six Hudson's Bay Company (HBC) inland posts were supplied by Cree-operated canoe brigades operating on the Rupert River out of Rupert House from 1812 to 1925. From 1910 to 1948, this was a canoe highway to Chibougamau, Lake Mistassini and Rupert River. It was so busy there were even locks.